The “Let’s Talk Witch” is a little longer than most. I don’t know about most of you but when the mainstream Religious holidays roll around, I have to stop and shake my head. For our Religion to have been so hated, what in the hell would the rest of the religions did without us? I can see all the similarities between our Religion and their religions. But we didn’t come up with those practices or beliefs they stole from us, they did. We are nothing but Evil, we have never had a good idea even come in our head. I know the older I get it makes me angry. I just want to climb to the highest mountain and scream, “TELL THE TRUTH WOULD YOU, YOU DAMN THIEVES!” Wouldn’t do any good but it would make me feel much better. I have leaders of other faiths write me and want to know, “why are so many people turning to Witchcraft?” Perhaps they are finally learning the truth and coming to the realization of what they have been really following for so many years. The following article is one of my favorites. It drives this point home and then some, I hope you enjoy it. Now that Christmas is fast approaching and the year has once more come full circle, most of us will soon be busy adorning the house with brightly coloured decorations, a Christmas tree and all the other paraphernalia that goes to create a festive atmosphere. What Christians celebrate as the birthday of Christ is really something that was superimposed on to a much earlier pagan festival–that which celebrated the Winter Solstice or the time when the Sun reaches its lowest point south and is reborn at the beginning of a new cycle of seasons. In Northern Europe and Scandinavia it was noted by the early Christian scholar, Bede, that the heathens began the year on December 25th which they called Mother’s Night in honour of the great Earth Mother. Their celebrations were held in order to ensure fertility and abundance during the coming year, and these included much feasting, burning of lamps, lighting of great fires (the Yule fires) and exchanges of gifts. The Romans, too, held their great celebrations–Saturnalia– from December 17th to 25th and it was the latter date which they honoured as the birthday of the Unconquered Sun. The Saturnalia was characterised by much merry-making, sometimes going to riotous extremes, with masters and slaves temporarily exchanging roles. The use of evergreens to decorate the streets and houses was also very much in evidence at this great winter festival. That we now celebrate the birth of Christ at the same time is largely due to the early Church Fathers who found it was much easier to win converts to the faith by making Christ’s birthday coincide with an already long established pagan festival. In fact, it wasn’t until the 4th century that Pope Julius I finally established the 25th as the official birthday of Christ; earlier Christians differed widely as to this date– some choosing September 29th, while others held that January 6th or March 29th were the correct dates. In old England, a decoction of holly leaves was considered a cure for worms; but most of all this prickly evergreen was looked upon as a luck bringer–particularly in rural areas where a bunch of holly hung in the cow shed or stable was thought to favour the animals if placed there on Christmas Eve. Many people used to take a piece of holly from the church decorations at Christmas as a charm against bad luck in the coming year. Holly was also considered a very protective tree which, if planted outside the house, was believed to avert lightning, fire and the evil spells of witches. 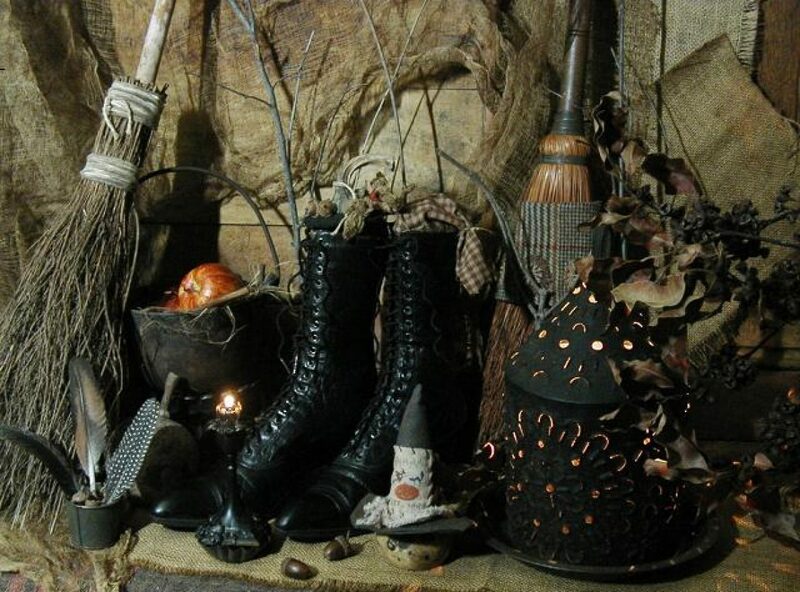 An old holly spell describes how to know one’s future spouse. At midnight on a Friday, nine holly leaves must be plucked and tied with nine knots in a three-cornered cloth. This is then placed under the pillow and, provided silence is observed from the time of plucking until dawn the next day, your future spouse will come to you in your dreams. Turning now to mistletoe, it seems that this is by far the most mystical of the plants associated with Christmas and has, from very ancient times, been treated as magical or sacred. It is often included in modern Christmas decorations simply for the fun of kissing beneath it and, though this seems to be a peculiarly English custom, it probably harks back to the mistletoe’s association with fertility. Mistletoe was considered something of a universal panacea, as can be gleaned from the ancient Celtic word for it–uile, which literally translated means ‘all-healer’. A widespread belief was that mistletoe could cure anything from headaches to epilepsy; and indeed modern research has shown that the drug guipsine which is used in the treatment of nervous illnesses and high blood pressure is contained in mistletoe. In the north of England, it used to be the practice of farmers to give mistletoe to the first cow that calved after New Year’s Day. This was believed to ensure health to the stock and a good milk yield throughout the year. Underlying this old belief is the fear of witches or mischievous fairy folk who could play havoc with dairy produce, so here mistletoe was used as a counter magic against such evil influences. In Sweden, too, a bunch of this magical plant hung from the living room ceiling or in the stable or cow-shed was thought to render trolls powerless to work mischief. With such a tremendous array of myth, magic and folklore associated with it, reaching far back into the pagan past, it is understandable that even today this favourite Christmas plant is forbidden in many churches. Yet even the holly and the ivy, much celebrated in a popular carol of that title, were once revered as sacred and magical by our pre-Christian ancestors. Posted on December 18, 2013 by ladyoftheabyssPosted in Articles, Daily Posts, The SabbatsTagged Christ, Christmas, Christmas decorations, Christmas tree, Druid, Holly, Mother goddess, Winter solstice, Yule. decorate with anything reminding them of a Christian Nativity. appropriate to both Christian and neo-Pagan celebrations of it. Posted on December 9, 2013 by ladyoftheabyssPosted in Articles, Daily Posts, The SabbatsTagged Amaterasu, Candle, Christian, Holly, Pagan, Religion and Spirituality, Santa, Santa Claus.